Stay Out LongerOmni-Shade clothing protects you by blocking the majority of the sun’s harmful rays so you can stay out longer. It’s like sunscreen, but you don’t have to re-apply. Your safety increases as the Ultraviolet Protection Factor (UPF) increases. 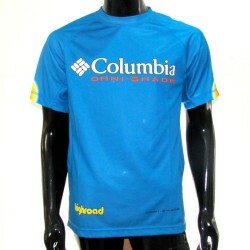 Great shirt for biking, hiking, and other outdoor sport activities. Omni-Shade blocks UVA and UVB rays, helping to prevent sun burn and long-term skin damage through tight weave construction, UV reflectors and UV absorbing technology. 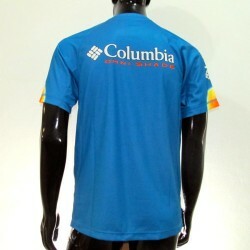 Blue with white Columbia logo on chest and back. Yellow High Road logo lower right front of shirt.